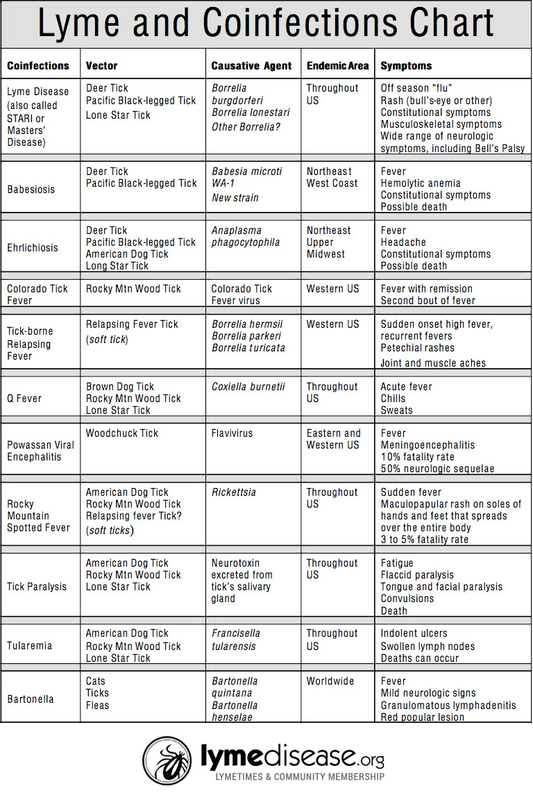 Besides the diseases described above, ticks in different geographic areas may be infected with one or more of the following Lyme disease coinfections: Colorado tick fever virus; Mycoplasmas; Powassan encephalitis virus; Q Fever; Rocky Mountain spotted fever (Rickettsia); tickborne relapsing fever, other forms of Borrelia, and tularemia. The Tick Chart tells where these diseases are found. We have not yet identified all the diseases that ticks carry and transmit. Colorado tick fever is caused by a virus carried by Rocky Mountain wood ticks. Symptoms are acute high fever, severe headache, chills, fatigue, and muscle pain. Mycoplasma species have been identified in ticks. Smaller than bacteria, they invade human cells and disrupt the immune system, causing fatigue, musculoskeletal symptoms, and cognitive problems. Mycoplasmas can be treated with antibiotics. Powassan virus causes tick-borne encephalitis. Patients may be asymptomatic or suffer severe neurologic compromise and death. Common symptoms may include fever, headache, vomiting, weakness, confusion, seizures, and memory loss. Long-term neurologic problems may occur. There are no commercial diagnostic tests for the disease, nor is there specific treatment. However, patients may need to be hospitalized to receive care to reduce swelling in the brain or for respiratory support. Q fever is caused by Coxiella burnetii, a kind of bacteria carried by cattle, sheep, and goats. Symptoms are similar to those of Lyme disease. Q fever is likely to start with a high fever. Pneumonia and abnormal liver function also suggest Q fever. Doxycycline is the treatment of choice. Rocky Mountain spotted fever is caused by bacteria called Rickettsia rickettsii that are transmitted by the bite of a tick. Patients develop high fever, rash, headache and bleeding problems. Thirty percent of untreated patients die. It is treatable with antibiotics, often doxycycline. Certain ticks secrete a toxin that causes a progressive paralysis, which is reversed when the tick is removed. The agent of tickborne relapsing fever, Borrelia hermsii, is carried by soft ticks of the western United States. It is characterized by cycles of high fever and is treated with antibiotics. Tularemia, or rabbit fever, occurs throughout the United States. It is caused by the bacterium Francisella tularensis. Symptoms may include skin ulcers, swollen and painful lymph glands, inflamed eyes, sore throat, mouth sores, pneumonia, diarrhea and vomiting. The most effective treatment is with fluoroquinolones.